Carter McDavid, a 20-year old athlete from Valley East is shown here on the right hand side of the photo at the home of his summer practice facility, the Valley Family Golf Centre. 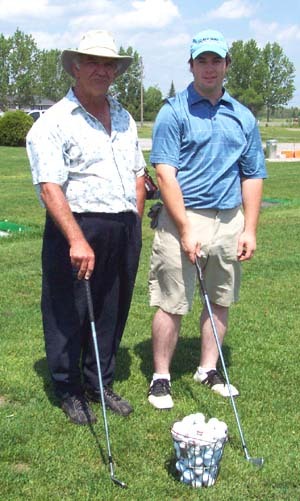 Vic Whissell, on the left, opened up the district’s most popular driving range just outside of Blezard Valley on Regional Road 15 eleven years ago. For the past thirty some years, Vic has been providing instruction to golfers of all ages and skill levels, but his heart has always been with the juniors. This summer, Vic will be the official summer golf coach for Carter, who attends Oakland City University in Southern Indiana on a baseball and golf scholarship. Vic’s role as coach will be to help Carter bring up his game a couple of notches in order to give him a better chance to become one of the top players on h is school team and also to become the first golfer from his school to qualify for the NCAA Division 2 individual championships. Carter will also be working with the Junior boys and girls who register for the Junior Golf League which runs every Thursday evening for ten weeks beginning on June 22 at the Whistling Winds Golf Course, which is part of the Valley Family Golf Centre, Up to 72 or more participants from the ages of 4 to 16 will play a nine hole round every Thursday as part of the league play. Carter will be working with the juniors each week helping them improve their individual games. In this way, Carter, who is in the four year physical education program at Oakland City, will not only have a chance to transfer some of the helpful advice he receives from Coach Vic Whissell to the young players, but he will also get some valuable teaching experience which will be useful when he enters the teaching profession upon graduation. When he is not golfing, you can expect to see Carter on the baseball field as an umpire, or as one of the premier pitchers for the Valley East Vipers where he is entering his 5th season with the Elite League Club. Carter’s skill level as a strong left hand pitcher, plus his remarkable talent on the golf course have made him one of the few people from the region to be awarded a dual-sport scholarship to a United States college. At only 16 years of age, Korbin Thibault, a resident of Val Therese, hopes that the release of his first ever CD will launch him on the road to a career in music. 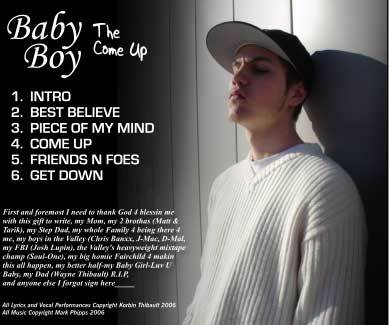 Korbin’s CD, entitled “The Come Up”, contains six songs that he wrote and sung in the ‘Hip Hop Rap Style’ that he loves. 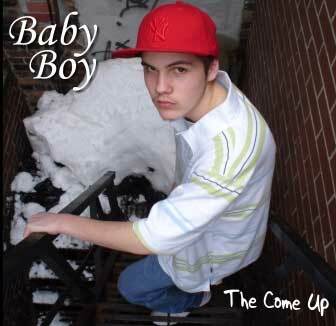 A Grade 10 student at Bishop Alexander Carter Catholic Secondary School , Korbin is now working on the production of his second CD which should be available for release some time in the fall. For now, he will simply introduce “The Come Up” to local residents who are interested in helping a young artist pursue his dream. Korbin will be in the Hanmer Valley Shopping Centre on several occasions during the coming months to promote the sale of his first CD. He will enjoy the opportunity to meet with local residents and potential young muscians to discuss their shared passion. Be watching in The Vision Paper for information about the days when Korbin will be at the mall. The CD is available at a cost of only $10. If you cannot make it to the mall you can call Korbin at 969-6941 and make other arrangements to pick one up. 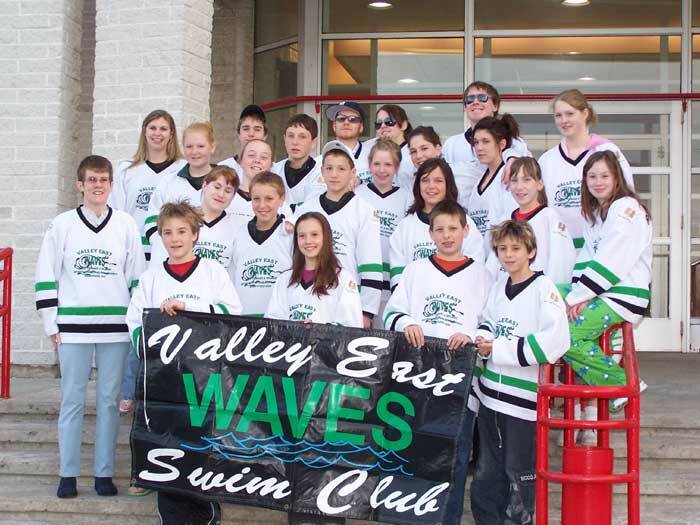 The 2005-2006 season will be remembered for a long time by members of the Valley East Waves Swim Club. For many, it marked the coming of age of their swim career and certainly went a long way to establishing Valley East as a swim capital within the Province of Ontario. The photo above is the team picture which was taken just before leaving for the Brantford Meet. Most recently, the club took part in the Invitational Meet in North Bay. The swimmers were entered in either the Ironman or Sprint events. The Waves won the Small Team High Point Award and Justin Leclair won the 11-12 Boys Sprint High Point, Spencer Hirschfeld was second in the 13-14 Boys Sprint, Ian Blechta was second in the 13-14 Boys Ironman and Tessa Jewell was third in the 13-14 Girls Ironman. There's no doubt about it: Mosquitoes are annoying. What's worse, their bites sometimes transmit serious diseases, such as West Nile virus. While your risk of getting diseases from mosquitoes is low, your risk of being annoyed by mosquitoes is high. In fact, mosquitoes may be so annoying that you don't even enjoy spending time outdoors. Although mosquitoes are most prevalent at dawn and dusk, it's not always possible or desirable to stay indoors during those periods — they may be peak time for fun activities. Insect repellents are one good way to keep mosquitoes at bay. When used properly, repellents are safe for kids and adults alike. Keep in mind that even though some of them are classified as pesticides by the Environmental Protection Agency (EPA), repellents don't kill mosquitoes. So you may still see the pesky critters buzzing about. Repellents simply make you more difficult to find. · DEET. This pesticide has long been the insect repellent of choice in the United States . DEET blocks a mosquito's ability to find people who've applied it. · Picaridin. This pesticide offers protection that's comparable to DEET at similar concentrations. It also blocks a mosquito's ability to find people who've applied it. Picaridin is nearly odorless, which may make it a good alternative if you're sensitive to the smells of insect repellents. · Oil of lemon eucalyptus. This plant-based chemical may offer protection that's comparable to low concentrations of DEET. · Others. Shorter acting repellents — generally containing plant-based oils such as oil of geranium, cedar, lemon grass, soy or citronella — may offer limited protection. Check the labels of insect repellent products to see which chemicals or other ingredients they contain. And be sure to follow the product's application guidelines. · If possible, empty wading pools and other children's pools at least once a week, and preferably more often. · Change water in birdbaths at least weekly. You can also purchase devices to place in birdbaths that keep the water circulating so that mosquitoes won't lay eggs there. 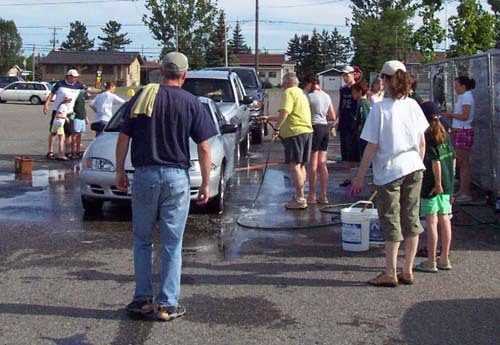 · Get rid of old tires in your yard, since they collect water. · If you keep unused containers, such as flower pots, in your yard, empty them regularly or store them upside down so that they can't collect water. · If you have a fire pit, drain any collected water regularly. If a mosquito still finds you to be a tasty meal, use hydrocortisone cream, calamine lotion or a baking soda paste to ease the discomfort of an itchy bite. A cold pack or baggie filled with crushed ice may help, too. If a mosquito bite seems to be causing more serious signs and symptoms — such as fever, severe headache, body aches, nausea, vomiting, swollen glands, a rash, lethargy, confusion or sensitivity to light — contact your health care provider. These signs and symptoms may indicate West Nile fever or, rarely, encephalitis. Prompt diagnosis and treatment are important. 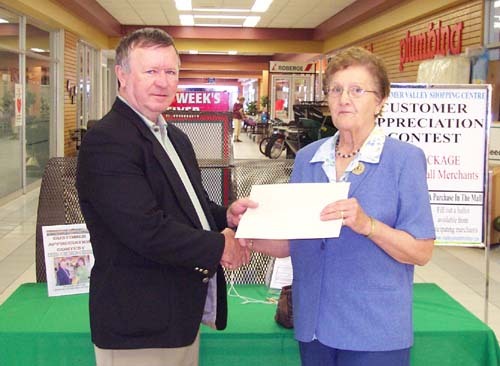 THERESE CAMPEAU, winner of the May 2006 Customer Appreciation Contest sponsored by merchants of the Hanmer Valley Shopping Centre is shown receiving her package of gift certificates worth over $1500 in goods and services. Robert Kirwan, Director of Marketing & Public Relations for the mall presented Therese with her prize package in front of the main ballot drum that is located outside of Desjardins' Food Basics. A new winner is declared each month. For a complete list of what Therese won, click here>>>. To see the prizes that are available during the month of June, click here>>>. On behalf of all of the merchants of the Hanmer Valley Shopping Centre, Robert Kirwan expresses sincere gratitude for all of the people who shop locally. Employment consultants from Cambrian College and College Boreal will now be working out of a new office soon to be opened in the Val Est Mall in Val Caron. Once open, local residents who are seeking assistance and guidance in finding meaningful employment will have much easier access to all of the resources available through this joint venture of the two colleges. 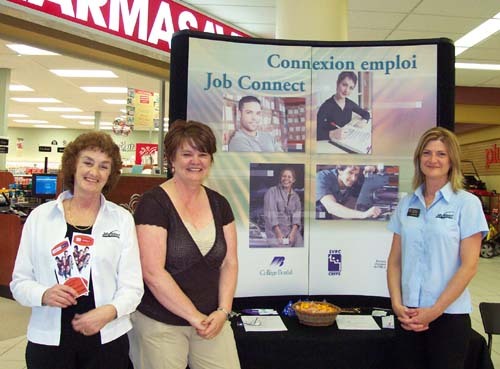 Job Connect / Connexion Emploi consultants were in the Hanmer Valley Shopping Centre recently handing out information packages and talking to dozens of people who are looking for employment. Shown in the photo are: Marg Perry from Cambrian College; Estelle Daoust of College Boreal, and; Carmel Medynski, of Cambrian College. All three are Employment consultants with the Job Connect / Connexion Emploi program. For more information, simply click on one of the names above and email them your request. Members of the Valley East Waves were up bright and early on Saturday, June 3, as they hosted the first car wash of the season at the Hanmer Valley Shopping Centre. All day long the cars were lined up waiting to get their vehicles shined up for the bright summer day ahead of them. The group had a great time and were able to raise some much needed money to help defray the cost of competition during the upcoming season. The Valley East Waves are just one of the many groups and organizations that take advantage of an open invitation by the Hanmer Valley Shopping Centre to use its facilities to promote their activities and raise money through fund raisers such as car washes, penny tables, raffle sales and bake tables. There is absolutely no charge for the use of the facilities and the mall even provides tables, chairs and other material to help the groups. The owners of the mall, Val and Violet Mazzuca, have been strong supporters of Valley East and Capreol and will bend over backwards to help out in any way they can. If you or your group would like more information about using the mall, simply contact the Director of Marketing & Public Relations, Robert Kirwan at 524-7006. 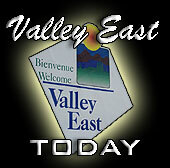 News of the approval of a new contract between Inco Ltd. and the Steelworkers was good news for Valley East and Capreol. It means that the excellent growth we have experienced in this part of the Greater Sudbury Area should continue uninterrupted. Among other things, he contract will amount to a total wage increase of about $2.50 an hour over the deal’s three-year term. Wage rates will be approximately $25.50 to $33.00 per hour by the last year of the contract. The full pension for retirees has increased to $3,300 a month from the previous level of $3,150. The new contract also provides layoff protection for the term of the deal. Union officials said profit-based bonuses could provide another $15,000 to the average worker over the contract’s term. The contract also provides a $4,000 signing bonus for each employee. The Town of Capreol is extremely upset at the announcement that Loblaws head office decided to close the 13,000 square foot Freshmart grocery store it operates in Capreol effective July 15. Former Mayor and Regional Chairman, Frank Mazzuca states that this is merely another blow to a town that has had more than its share of setbacks in recent years, especially since being amalgamated into the City of Greater Sudbury. The grocery store on Young Street was established by Fiore Mazzuca in 1929 as a confectionery store which then turned into a grocery store. His son, Val Mazzuca, took over the business in 1953 and operated a very successful grocery business doing approximately $150,000 a week in sales until he decided to sell it to Loblaws in 1995 under the Freshmart brand. "It's been open since 1929, when my father started it as basically a confectionery store, then it turned into a grocery store," said Val Mazzuca, Frank's brother. 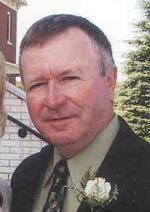 Val Mazzuca took over the business in 1953 and operated the store until his retirement in 1995. During much of that time, the store was known as Mazzuca's IGA. Mazzuca and a majority of the residents of the community feel that it is just not right for Loblaws to pull out and leave the town without a grocery store. Val Mazzuca indicated that he was going to do whatever he can to attract another person to operate the store. Meetings will be held at the Capreol Arena on June 8 at 7 p.m.; at the Centennial Arena on June 11 at 1:30 p.m.; at the Ray Plourde Arena on June 19 at 7 p.m.; and at the Rheal Belisle Centre in Blezard Valley on June 29 at 5 p.m. It is estimated that within the next five years over 95 percent of all jobs will require some form of post-secondary education or training. People may still be able to find a "job" directly out of high school, but those jobs will seldom lead to meaningful careers without some additional educational traiining. Four local institutions, including Cambrian College , College Boreal, The YMCA Employment Services Centre and the Sudbury Vocational Resource Centre received a total of about $4.1 million funding recently through the province's Job Connect program. This funding will help job-ready graduates connect with employers in need of skilled personnel. Sudbury 's two colleges will also share $751,922 to provide more than 900 apprentices with classroom training. Sudbury MPP Rick Bartolucci announced the funding. A consultant from Oakville has proposed a plan which he says would reduce the mosquito population in the Greater Sudbury Area by 80 to 90 percent. Jack Sloggett, the Ontario business development director for GDG Environment which operates out of Oakville, was hired by the Sudbury and District Health Unit to help develop its West Nile virus program. Sloggett pointed to the multitude of swamps and standing water in the region as the main breeding grounds for these pesky insects. People in the north have accepted the fact that mosquitos and black flies exist and we simply put up with them. 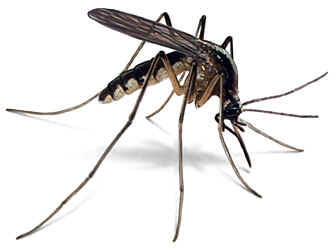 However, for a cost of about $500,000 per year, the mosquito problem in the region can pretty much be controlled. The question is whether or not the residents of the area are willing to pay up to $40 per household to fund the project. Given the current state of finances with the region, it is not likely that such a project will be implemented or even considered in the near future. One day, many years ago, I was standing in the hallway at a local elementary school watching a teacher bring her class to the gym when I overheard the most philosophical question I have ever encountered in my life. It is such a simple question. For example, everyone knows that you must watch “where you are going” when driving a car; walking along the street; or in a line-up at the grocery store. It only makes sense unless you want to bump into everything in your path. Nevertheless, how many times have you avoided doing something you really wanted to do in your life simply because you “looked behind” and saw that you either failed at it before, or were afraid of making a mistake that you once made in the past, or you thought that people would hold your past reputation against you? Let’s face it! We have all been there! Each and every one of us can pick out at least one “regret” in our life. At least one thing that we really wanted to do, but our “past experiences, fears or reputation” forced us to forgo that dream. There is absolutely no question that we’ve all done things in the past of which we are not proud. We’ve all done things and said things that we wish we could take back. Unfortunately, what is done is done. You can’t turn back the clock. You can’t “undo things you have done” or “take back anything you have said”. All you can do is “look ahead” and make sure that you do and say things today that will take you where you want to go tomorrow. You have to look ahead in order to see where you are going. You know where you’ve been in the past. You know from where you have come. If you are not proud of where you’ve been, if you are afraid your reputation will come back to haunt you, just make sure you don’t make the same mistakes today and go forward with your life as if it is a new beginning. People are very forgiving and will allow you to make a new start. They will even give you support and encouragement when they know you are trying to make things right. Perhaps the only thing worse than “looking behind” yourself, is when other people are always “looking behind” for you. When people are always bringing up your “past” and preventing you from moving forward. These are the “dream killers” who deep down are either jealous of their own failures in life or who get their personal satisfactions from destroying the self-esteem and ambition of those around them. Don’t allow these “dream killers” to get you down. Refuse to look behind at your past. Refuse to acknowledge the attempts of others to put you down because of past mistakes that you may have made and for which you regret. And for goodness sake, please don’t ever become a “dream-killer” yourself. Don’t fall into the habit of judging a person by mistakes he or she has made in the past. Look instead at what the person is doing today. Look instead at where the person is heading and help that person “look ahead”. Help that person stay focused on the path that lies ahead.